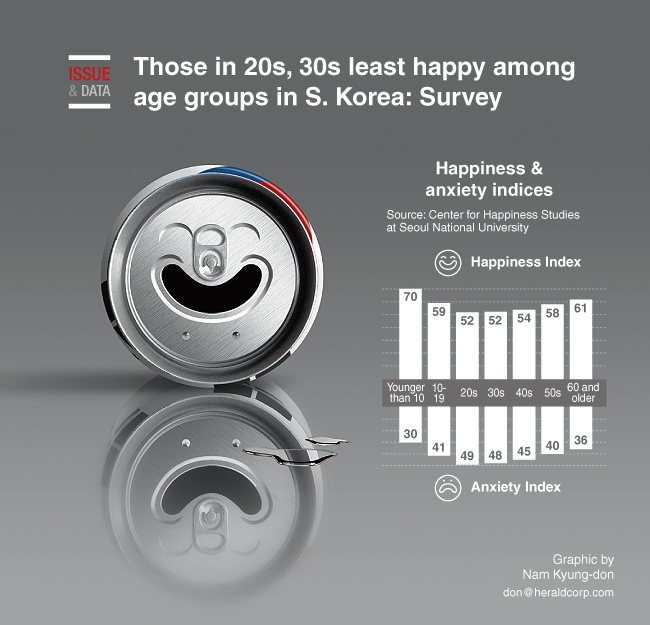 According to new survey results, those in their 20s and 30s in South Korea are less happy than other age groups. The Center for Happiness Studies at Seoul National University and KakaoTalk, the country's top mobile messaging service provider, unveiled the results of their joint survey conducted on the Mind Weather website, which opened in September. In the combined Happiness Index, respondents in their 20s and 30s tied for the lowest score of 52 on a scale of 1 to 100. Children under the age of 10 had the highest score of 70, followed by those aged 60 and older (61), those in 10-19 (59), those in their 50s (58) and those in their 40s (54), Yonhap News Agency reported.